Sussex exposed Durham's fragility with the bat in their Specsavers County Championship Division Two match at Emirates Riverside, reducing the home side to 92-7 at the end of day. Durham were inserted following an uncontested toss and were put on the back foot by impressive bowling from the visitors. David Wiese led the way with figures of 3-12, while Ollie Robinson also notched a couple of wickets to continue his impressive term. Wiese said at the close: "We did consider batting first. The wicket seemed quite dry and it can be tough batting on the fourth day. Ultimately when you come up here you always expect to bowl first. It's ideal conditions for seam bowlers, I think the guys pitched it up nicely. We used the conditions to our favour. 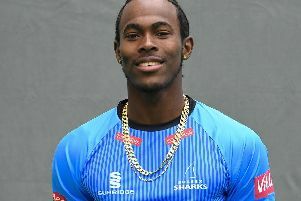 "Ollie Robinson and Jofra Archer have been fantastic for us throughout the season always getting early wickets for us, and myself and Chris Jordan come in and mop up towards the end. Ollie went past 50 wickets for the season last week, Jorfa has caught up to us quickly after missing the first four games due to the IPL. "We've had a good bowling attack throughout the season. The boys have worked hard to get that consistency going the whole time. We're getting the benefits going towards the end of the season. "It would be nice to get the five-wicket haul in the morning. I don't know whether I'm going to get the ball first up, the other guys will be biting at my ankles to get the ball. Either way whatever happens, I'm happy to contribute to the team. It's going to be tough for the batters throughout the game, we're going to have to scrap it out. Sometimes you're going to have to put in hard graft and get lucky." Only one over of play was possible in the day-one morning session because of bad light. Cameron Steel successfully negotiated the spell from Robinson, although he did get off the mark by edging through the slips to the boundary. Will Evans' lucky socks help Sussex?